← Must we all be entrepreneurs? “She is living her dream,” said my daughter in summary of a friend we visited over Columbus Day Weekend 2010. If I had tried I couldn’t have figured out how to get that message across so simply and completely to my children. We were visiting our former nanny who had been with our family for five years. She joined us when my daughter was ten weeks old and stayed until she was going to kindergarten. She was a gifted person who cared for our entire family in a special way. Thanks to her we still create banners for special events — and I still impress folks with my food presentation – shockingly. Proof positive that after five years of wonderful cooking and surprises from our nanny and her two helpers, our children, I finally learned! Our nanny relocated to Virginia to be closer to her family and to go back to school. At 40-something we were thrilled for her but heartbroken at the same time. When she left our daughter — all of us really but mostly my daughter – suffered a real loss. For my daughter it was a loss that I’m not sure she’s over but she was able to process it more completely after we visited almost 24 months later. So how does living a dream jive with negative people & transition? Truth be told I need to cling to this story this week as ballast. My advice at the time was initiated from a cozy distance. I didn’t work for this guy nor did I work at the organization but I interacted with her boss all the time. From my view he wasn’t being negative. I classified him as a “boundary seeker.” His questions – to me – didn’t seem to be looking for right or wrong. For me he was simply trying to understand “completely” what the other person was saying. He was mentally marking off where the “boundary” was. In a visual sense, it is like a dog marking off a territory. His style was very unsettling to many who interacted with him. Have you ever encountered someone like this? For my friend, interactions with this “boundary seeker” were incredibly negative. The reality is that I could offer an opinion — even if it was off-base – because I constantly live that behavior. You see my husband is an electrical engineer who knows every answer to every question that has ever been asked. It is exhausting. He is a boundary player and I, an optimistic boundary-less person, have to run against this all the time. Most days, not all, I sail on through. So why am I telling you this? It has been a tough week. Transition to me this week is all about a mental game — a game of trying to keep myself out of negativity and cling to the concept of living a life defined by dreams. I remember reading Martha Beck’s Steering by Starlight this summer. While I wasn’t too thrilled with the book – she did point out that friends and family can often throw substantial hurdles at us during transition. I’d prefer the game in Benjamin Zander’s The Art of Possibility. In it he tries to eliminate the measurement world we all inhabit. You know questions like, “What are you doing?” or even my children’s, “Mom, can’t you have a normal job?” He suggests pivoting away from measuring ourselves against someone’s expectations. Rather he advocates giving everyone an “A.” A silly proposition but one that screams for the suspension of measurement – at least for a time. Anna Fels also had a hand in this. In her Necessary Dreams she relates that society has taught us to seek affirmation; it is a fundamental part of ambition. When that is absent — for whatever reason — the cumulative effect can be quite harmful. Have you ever allowed someone else’s negativity to impact you? If I’m really honest my transition started when our 1st nanny departed. She was an external trigger — positive or negative – I can’t really recall. My struggle for ballast this week is making things pretty foggy. She is living her dream. Are you? 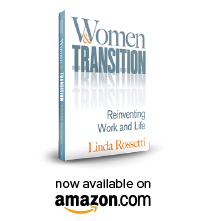 This entry was posted in Observations on Transition and tagged career transition, novofemina, observations from a women's transition, women's transition, women's transition issues, women's transition process. Bookmark the permalink. Thanks for the post Linda. I’m trying to live a couple of dreams and I admire that you are as well. I know a post or two back you mentioned wanting more feedback from readers. I’ve been reading since your first post and look forward to each one. I’m more one to read than to comment, but I wanted to let you know I do nod my head and grin or take what you’ve written off into my day to think about. I hope you stick with it until it takes you where you’re going ( or where you’re going until your next transition). Good luck to you and to your nanny and her cafe. Melanie, Thanks for the good wishes and your continued reading! No worries if comments aren’t your thing. We’d love to hear from you whenever it makes sense.